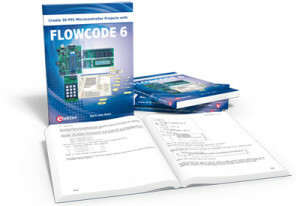 We’re very excited to be releasing a new Elektor publication, Create 30 PIC Microcontroller Projects With Flowcode 6, which will guide you through the use of Flowcode version 6, beginning with lucid, down-to-earth tutorial projects and progressing to more ambitious and challenging projects with a consistently erudite and lucid mode-of-address. Flowcode version 6 is a state-of-the-art, all graphics-based code development tool which enables you to develop PIC microcontroller applications with the greatest of ease and enjoyment; it allows those with little to no programming experience to create complex electronic systems in minutes! This book is an invaluable educational resource, with each project presented with screen images, schematics and Flowcode diagrams. Upon reaching the book's conclusion, you’ll have made secret doorbells, youth deterrents, GPS trackers and internet webservers, among a wealth of other fun and innovative projects. All sources referred to in this publication are available for free download, including the support software. E-blocks® are used as the hardware building blocks for the projects in this book, making them easy to put together quickly and reliably—without soldering. This essential textbook will be in stock by the end of August. We’re offering a 20% discount to anyone who preorders it now. Don’t delay, this textbook is sure to be a bestseller!